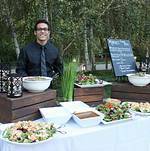 Last year we catered a corporate BBQ party for one of our clients, a nationwide landscape design company. The event took place on the company's campus, which is located alongside the beautiful hillsides of Calabasa, CA. Our client was celebrating an event that was designed for team-building and employee appreciation. Many of the employees had been flown in from across the country to attend the event. 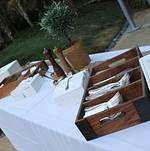 I really wanted to create an elegant and refreshing menu that was still hearty and fulfilling for the mainly male guests. That's right! Hearty "man food" that's also presentable.